Fun with my iPad 3! I really liked my first iPad but I REALLY REALLY like my new iPad 3. I am having a blast using app after app to create and re-create images. I especially like the fact that I can start with my own artwork and transform it. 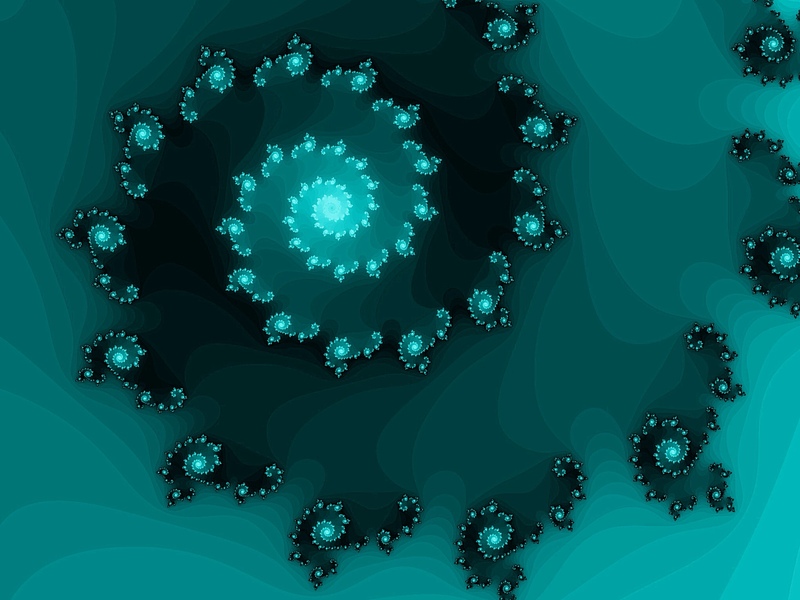 I started with Fractile Plus, then took this fractal image through Photoshop Express. Untitled, a photo by Carol L. Myers on Flickr. 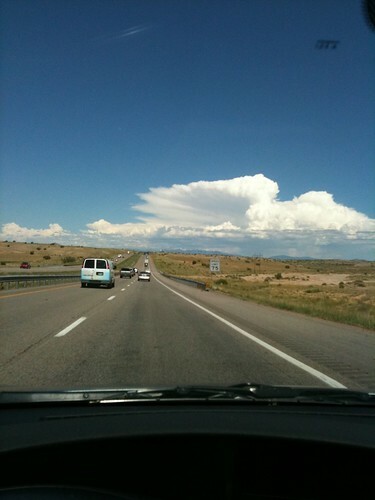 The clouds were amazing today as I drove from Albuquerque to Santa Fe. I’ll be spending a week here taking an encaustic monoprinting workshop with Paula Roland. It’s my reward for having chaired our Stutz Open House this past April. The clouds over the mountains are awesome, and nothing like I’ve seen before. The workshop starts tomorrow, today was a travel and get lost day. A local artist told me that Santa Fe was designed by a drunk on a mule-it is surely confusing. I may have to get a compass for the rental car-I am consistently disoriented as to direction-usually headed the wrong way. Inspired by Japan proof, a photo by Carol L. Myers on Flickr. Here is the first proof -the first time ever that I printed in the ‘white line’ method-obviously not enough pigment on the top half of the print. But I’m pleased with the detail of the color on the lower half of the print. I’m using hosho paper here, and realize that I need to do some proofing on the final paper that I hope to use-eek, $20/sheet. Luckily, McClain’s offered Baren members a half price deal on paper for this project. Thanks to them!! 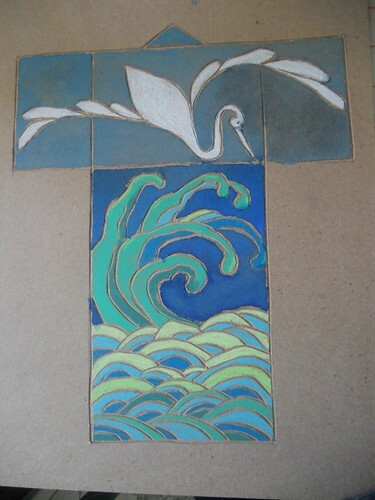 inspired by Japan block, first coloring, a photo by Carol L. Myers on Flickr. I am currently working on a woodcut print (or relief print) for a project by the Baren Forum online printmaking group. The prints will be shown around the world, with all proceeds going to the Japanese tsunami relief. I decided (perhaps foolishly) to experiment with a method of printing called ‘white line printing’ where the lines are carved out and stay white, and the rest of the block is hand colored. After all of the colors dry, you mist the block with water and print all of the colors at once. This is my first block, and I used particle board rather than a wood plank for ease of carving. I am happy with the design, but way over my head in terms of printing expertise. Over three weeks since the excitement of the Stutz Open House that I chaired and participated in. The event was a success, the studio is back to working order(read messy) and I am stalled, stopped in my tracks, stale. I wonder how many artists have some plan in place to bridge the gap between show and studio? I really didn’t expect to get stuck. Of course, I never expected to have baby blues either, and after four children I knew better. So now I am faced with re-tooling my plans and visions. First, I’m going to take some much needed R&R by taking the bird kids and myself up to Michigan and the lake house. There I will spend a week just hanging out-pictures to come-and maybe even working in the studio some. And second, I just signed up for an encaustic monoprinting workshop in Santa Fe in August. As my dear son would say, ‘Woot’. I’m not much of a traveler, but I think this will get my creative juices flowing, and a change of scene will be wonderful. I’d love to know how other artists keep moving after major events are over! uui show, a photo by Carol L. Myers on Flickr. Here’s a photo of me at the Unitarian Church where I have my solo show titled “Pencil Prayers and Other Meditations”. The pencil prayer in the photo is graphite and oil paint on Yupo paper. 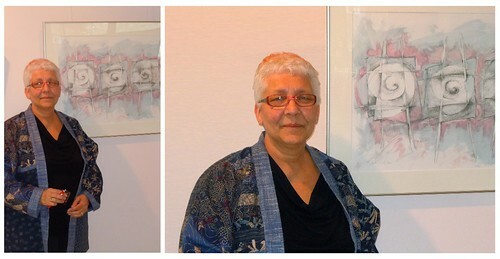 April 29 and 30 are THE days to plan on coming to the Stutz Artists Open House. I can’t believe that it is this close-especially because I’m the chair person for the event. whew it’s been a crazy ride so far. I will get all of my work back from my solo show at UUI (Unitarian Universalis Church of Indianapolis) Monday morning, and then I will have to try and figure out how to fit all of it into my studio. I have 45 pieces in the show, and I know not all of them will fit. As promised, I melted some wax and started playing with encaustic. I know now why I’ve been procrastinating-there is of course a learning curve and that comes with some frustration. Anyway, these are the two pieces for my first experiment. As I am most interested and fond of line, I think this medium might be a challenge. 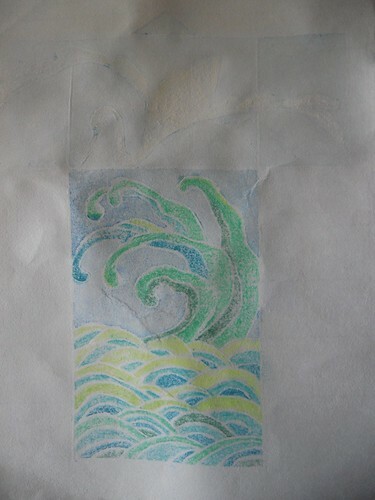 Next plan is to try some monotypes on paper. I’m sitting at home processing a wonderful weekend master class with Laura Cater-Woods. Not only was it a great experience, but I loved sharing my wonderful studio space at the Stutz Business center in downtown Indianapolis. Remember this always: The living of your own life writes the book of your most sacred truth, and offers evidence of it.